Have scientists discovered how to create downpours Artificial Rain in the desert? For centuries people living in the Middle East have dreamed of turning the sandy desert into land fit for growing crops with fresh water on tap. Now that holy grail is a step closer after scientists employed by the ruler of Abu Dhabi claim to have generated a series of downpours. Fifty rainstorms were created last year in the state’s eastern Al Ain region using technology designed to control the weather. 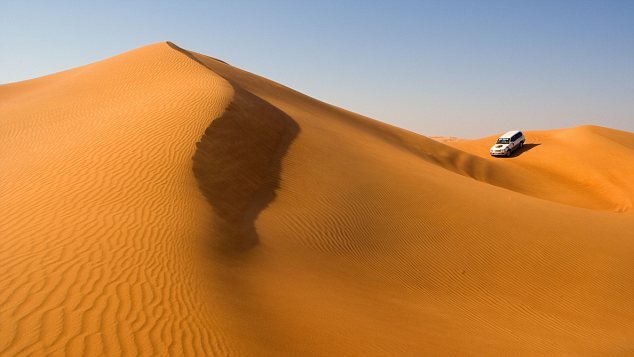 Plan: Scientists are attempting to make clouds in the desert to give man control over the weatherMost of the storms were at the height of the summer in July and August when there is no rain at all.People living in Abu Dhabi were baffled by the rainfall which sometimes turned into hail and included gales and lightening. The Metro System scientists used ionisers to produce negatively charged particles called electrons. They have a natural tendency to attach to tiny specks of dust which are ever-present in the atmosphere in the desert-regions. These are then carried up from the emitters by convection – upward currents of air generated by the heat release from sunlight as it hits the ground. 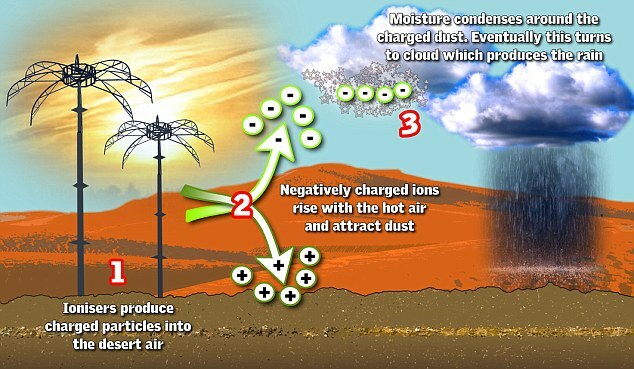 Once the dust particles reach the right height for cloud formation, the charges will attract water molecules floating in the air which then start to condense around them. If there is sufficient moisture in the air, it induces billions of droplets to form which finally means cloud and rain. The scientists have been working secretly for United Arab Emirates president Sheikh Khalifa bin Zayed Al Nahyan. They have been using giant ionisers, shaped like stripped down lampshades on steel poles, to generate fields of negatively charged particles. These promote cloud formation and researchers hoped they could then produce rain. In a confidential company video, the founder of the Swiss company in charge of the project, Metro Systems International, boasted of success. It is believed to be the first time the system has produced rain from clear skies, according to the Sunday Times. In the past, China and other countries have used chemicals for cloud-seeding to both induce and prevent rain falling. Last June Metro Systems built five ionising sites each with 20 emitters which can send trillions of cloud-forming ions into the atmosphere. Over four summer months the emitters were switched on when the required atmospheric level of humidity reached 30 per cent or more. While the country’s weather experts predicted no clouds or rain in the Al Ain region, rain fell on FIFTY-TWO occasions. The project was monitored by the Max Planck Institute for Meteorology, one of the world’s major centres for atmospheric physics. Professor Hartmut Grassl, a former institute director, said: There are many applications. One is getting water into a dry area. The savings using the Weathertec technology are huge with the system costing £6 million a year while desalination is £45 million. Building an ionising system is about £7 million while a desalination plant would be £850 million and costs a lot more to run. Some scientists are treating the results in Al Ain with caution because Abu Dhabi is a coastal state and can experience natural summer rainfall triggered by air picking up moisture from the warm ocean before dropping it on land. But the number of times it rained in the region so soon after the ionisers were switched on has encouraged researchers. Professor Peter Wilderer witnessed the experiments first hand and is backing the breakthrough.